FAMILIARIZING AND EXPOSING THE HORSE TO MAN-MADE AND NATURAL WORLDS. Part I in this series of articles described the origins of the Pyramid of Training, its use, and its basic purpose. Figure 1 in this second article hopefully sheds an expanded view of the current USDF model, my intention being to present a more accessible guide to a wider range of horsemen and women. Having been a dressage "trainer" for many years and also "one who sought a better approach," I am aware of the many dressage enthusiasts who seek a more relationship-based approach to their work with horses. I have likewise found that dressage, when practiced mindfully (the way it was originally intended), can give horsemen from all disciplines a broader understanding of practical horsemanship. 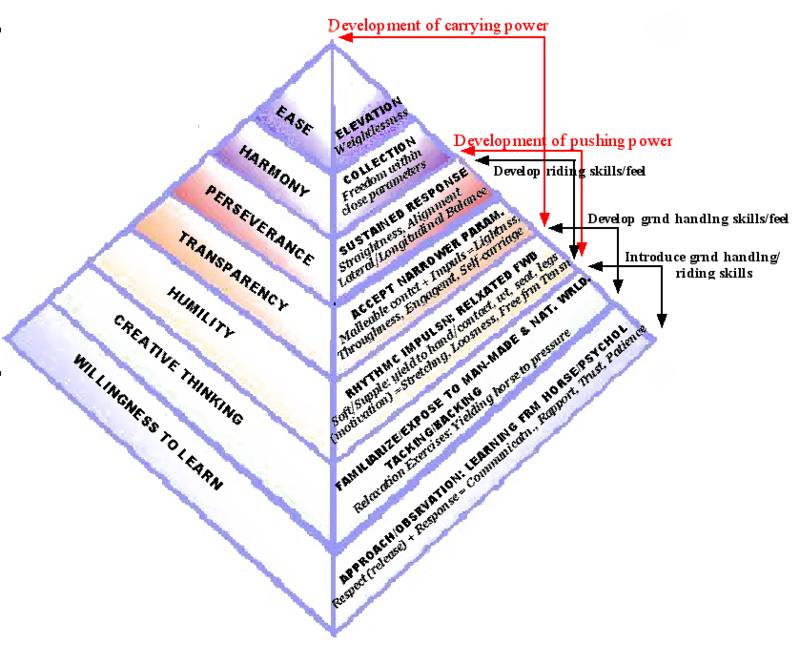 As mentioned in the previous article, there are three sides to the pyramid shown here. Each side or face is divided into tiers, representing stages of progression. The stages are listed from the bottom upwards, as you would walk up a stairway from the ground, stressing the importance of establishing a foundation before moving to the next level of complexity. On the right face, the top text-line in each tier states the outcome that will be aimed for within each stage. The line below it (in italics) describes the prerequisite for achieving that outcome. These prerequisites could also be identified as positive qualities, or a feeling sense that begins to emerge as a result of taking specific actions that benefit the horse and further the person's understanding of "why," "how," and "what for." These qualities are both a goal and a means to a goal, and are necessary for a person to learn to feel for in order to understand the true meaning of the words used to describe the outcome. The words correlating to the left face of the pyramid suggest a mindset or sense that a person can develop and use as the backbone of their work in order to sustain a rapport with their horse, particularly as that work becomes more demanding. To the right of the pyramid are phrases that correspond to the back face (the side you cannot see) and speak to a general purpose and intent of each phase. The words in black refer to the person. The words in red refer to the horse. It's important to note that in real life each stage of development is not limited to its tier, nor are the concepts written on the page always absolute. The structure itself is for the sake of communicating concepts in writing. In Part I, I described the first or bottom tier of the pyramid and some of the many experiences, emotions and insights that might emerge as we work to build a foundation of trust and rapport with our horses. As we begin working with ideas listed in the second tier, we might be exposing a young horse to the trail, but in the same breath the trailer, crossing streams and cement streets, being in open and enclosed places, in dark and light spaces, busy and quiet places. We're getting our horse used to wearing a saddle or harness, and accepting our weight. If we're a novice, we're continuing to learn about coordinating our body parts along with whatever type of tack and equipment we're using. In being students of the horse, our goal is to build on our developing communication skills, and riding and handling skills so that the trust and rapport we established with our partner from the beginning gets carried forward into whatever we do next. If we allow ourselves to move at a pace appropriate to us, we'll gradually gain confidence in our abilities. If we're experienced, we're continuing to develop our feel, coordinating many things at once and often incorporating aspects of stages to come, perhaps within a very short period of time. After many years of working with horses, however, I often feel like a beginner and a slow learner, particularly if I'm trying something I haven't tried before. Fortunately for me, horses care nothing about time. I also had the great privilege of working with someone who was quick to forgive the ineptness and insensitivities of the human. Within a short time of being under his influence, I began to question the criticisms and judgments I had habitually placed upon myself as well as the horse. His acceptance of me and my imperfections helped me learn to let go of having to do the "right" thing all the time. This did not mean I stopped trying to do the right thing, it meant learning to be okay with making mistakes. Being okay with making mistakes meant that I became less afraid of trying new things. In giving myself a longer rein, my need to become irritated at myself and the horse lessened its grip. I no longer felt so ashamed of looking messy and uncoordinated, or of not coming up with all the answers. I became free to simply pay attention to what was happening before me. Each day became all about discovery instead of trying to prove something to myself or to others, particularly my students. I was free to enjoy learning again and so began to think creatively, or outside of my preconditioned frame of reference. I began to be able to problem-solve my own way through a difficult situation instead of having to always look to someone else for "the answer." Relaxation exercises: Yielding the horse to pressure. Here is where the integration of my dressage background and my decision to learn a "better approach" really began to take hold. Tom Dorrance used to talk about the third factor, or spirit of the horse, alluding to how a horse's sense of self-preservation applied to its physical being, but not only its physical being. When I would visit him, we sometimes spent entire afternoons just "petting on the horse" so I could learn to observe their reactions and the ways they had of "letting down" in response to various kinds of touch and calm interaction. Having these opportunities to slow myself down made me aware of a degree of sensitivity I had not thought existed, or rather, that I had forgotten made up the basic nature of all living things-including myself. I began to realize that the horse was like I was before too many loud voices had deafened my ears, before too much disappointment had closed my eyes to the world, and before too many responsibilities had dulled my awareness of the things and the people around me. For example, before I met Tom, I used to think that my horses should yield or acquiesce to whatever demands I made of them just because I had made them. But I learned that they had their own reasons for not complying. It began to make sense that surviving as an herbivore in the wild necessitated a degree of sensitivity that allowed them to be aware of everything that was going on around them. The slightest movement, noise or scent could mean danger, causing them to run, or escape, as their first means of defense. Pressure or coercion of any kind, therefore, would feel confining, and translate into an inability to protect themselves. In being robbed of their autonomy, they were no longer in charge of their sense of well-being. And so, while I had been busy, day after day, year after year, doing what I wanted to do with them, they were busy learning to calculate my every move, then disregarding me or shutting me out in order to preserve a modicum of their own sense of self. They fled far away from me, psychologically if not physically, because the kind of sensitivity they had developed for survival was the same sensitivity that could not process and sort out most of what I expected from them on a moment by moment basis. In sensory overload, they simply developed intricate patterns of resistance for self-preservation, while I went on getting tougher and more demanding. Tom, however, gave me permission to not have to get anything done with my horses. Simply standing close to them, having no agenda but to explore the feel of their bodies, I began to notice a yielding to my touch, and not only because they stepped out of my way to reposition a body part. I was also learning to feel the kind of yielding where all tightness in that part of their body was released. I realized then that if I were mindful enough, I could reframe my concept of pressure, and use it to affect relaxation instead of merely using it as coercion. For example, the more immediate and superficial use of pressure, although important in and of itself, might happen when I place a hand on a shoulder or hip and apply pressure where I need my horse to step over and accommodate my space. At that moment he has some choices. He can refuse to budge, push back against me, or he can yield to the pressure. If he resists and I hold my ground, then he is stuck with the pressure, which does not gain him relief from it. If I give him the time he needs, however, he will search for "another way out." If I then time my release as he yields, the next time I ask him to yield that part of his body, the response comes more readily. He can begin to trust that I will get out of his way at the appropriate time, and what initially might have taken the weight of my body eventually takes the slightest touch, and then perhaps only a thought because he knows that the quicker he yields, the sooner he'll find his freedom. That's one level of response. It shows respect from my horses toward me, and makes it easy for me to work around them. But understanding how this benefits them begins with realizing that each time they yield, they're also giving up a brace-or a defense-at least for that moment. The pressure, then, becomes more than just a means by which to get them to step out of my way physically, but a means to help them "let down" emotionally, allowing them to be soft to my touch. If I take the time to achieve this kind of response over their entire body, they will learn to be yielding (soft) everywhere. This requires trust. Their brace, or resistance, has protected them from the kind of unawareness and insensitive handling that kept them from trusting, then yielding, and then letting down around me in the first place. For them to yield means they trust that I will allow them the space to be themselves. Learning how to achieve this quality of response takes time and practice. I am also well aware of the difficulty in applying something in real life that one read about in a book. In an article such as this, there is even less space to explain concepts thoroughly. But for those who would like to experiment with the ideas presented here, I offer a few ways to go about them. If you try them, please be prepared that they might not work out as easily as it reads on the page. Beginning from the ground, many of us have used the pressure of our hands behind our horses' ears to lower their head to accept a halter or bridle. Taking this a step further, we can also note that when they lower their head, they are stretching the muscle groups over their top line. This stretch is a way of enabling them to release tension and tightness longitudinally, from the nose, over the top of the neck and back, and all the way down the back of the hind legs (hamstrings). Ideally, our horses will learn to yield to our hands if we place them behind the ears, on the bridge of the nose, the forehead, or on the halter lead, ensuring that they can accept pressure anywhere around the head. It may take just a little pressure from us, or a lot of pressure to get the initial response. There is a major difference, however, between pulling or pushing our horses' heads down, and becoming sensitive enough to feel when they actually release a brace. A brace is usually released incrementally, little by little, and so we'll want to make sure we release the pressure each time they yield, whether they've moved a mere half inch, or six inches at a time. There is no hurrying for this process to work, and it helps if we can give ourselves a block of unpressured time to experiment and explore applying various types of pressure. 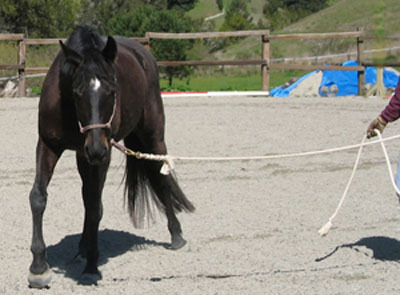 Here is a young horse learning to relax and stand quietly with the person in a non-pressured environment. This is not the same as achieving a rote or mechanical response. If our horses are truly releasing a brace, or part of a brace, we will feel them become physically softer and more malleable underneath our fingertips. More importantly, we will see them become calmer as well. There will be a greater sense of ease and lightness in their response and in their overall expression, often accompanied by soft chewing and yawning. In the beginning, this may only last for a moment, but as our horses learn to trust us and feel comfortable with maintaining a non-defensive demeanor within their own skin, they will "carry" this calm softness more consistently over time. If not, we know their response is mechanical, telling us we're not interacting with them in a way they need in order to let down from the inside. Perhaps we're not releasing enough, or soon enough, or applying the right degree of pressure long enough. Or perhaps we're trying too hard and not giving them a long enough pause in between the times we're asking something of them - a vital part of the process commonly overlooked. The underlying goal, then, becomes feeling softness and calmness emerge, rather than getting the nose to the ground, which becomes a secondary goal. It might be important to mention that horses who are "quietly non-reactive" are often mistaken for being relaxed. But a lack of reaction to stimulus is not always relaxation, as many who thought they bought a "bomb proof" horse discovered after bringing it home and, in a few weeks or months, watched it become increasingly unmanageable. Horses who are shut down or tuned out are often "quiet," but when brought into a new environment "unwind" or "wake up." Buyers might do well to beware the horse who is quiet but stiff as a board. A truly relaxed horse is supple and responsive because he uses little or no brace to defend himself against our touch or our actions. He has no need for that defense because he has learned to adjust himself to our presence and whatever we are asking of him. He has learned this because he was, at some point, given the time and space to learn it from a mindfully observant horseman. Along the same vein, a relaxed horse has also been given the opportunity to learn to discern between stimulus that is meant for him, and stimulus that is not. This is quite different from a horse who has been exposed to stimulus in order to learn to shut it out out for the sake of becoming non-reactive. 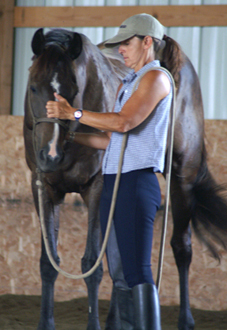 A release of tightness can also occur within the muscle groups along the sides of the horse's body, or laterally. 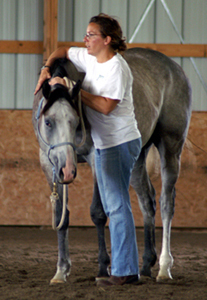 By applying pressure with the hand on the jaw or nose to create a simple flexion of the head and neck to the side, for example, and then releasing that pressure when our horses yield to it, we can provide a way for them to let down via a different set of muscles (the ones along the side of the neck, shoulder and rib cage). In addition, when one set of muscles soften, another set is often affected. Softening the lateral muscle groups will greatly encourage a longitudinal release as well. How far the head and neck is flexed is not always important. Any horse can be made to bring their nose all the way around to their girth area. But if we focus on where our horses yield, and how a brace melts away as we release ~ whether their neck has flexed an inch or a foot ~ we not only learn how to help them soften, but we learn what is going on inside them emotionally. Experiencing true relaxation and softness in them means that we, too, are engaged in that process, offering ourselves many opportunities to let go of habitual tensions as well. 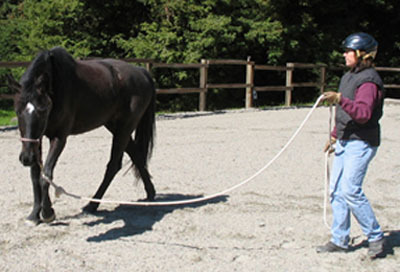 Once the stretch is felt at the stand still, it can be tried while our horse is in movement. When the head is up in the air in movement, all the muscles along the neck and back are contracted or tight (hollow or inverted). When the head and neck are low (round) or to the ground (stretched), the same muscles along the top line are softer. This means that the stride gets longer because there is less restriction within the muscles to prevent a loose, free reach or overstep. The same flexion and release (turning the face toward us, then letting it straighten) used at the standstill, can now be applied from the end of our lead or longe line to achieve lateral and longitudinal suppling. We may need to begin by walking with our horse with one hand on their shoulder to keep them from turning their whole body into us as we flex their nose toward us. But when they are soft enough to flex without leaning too much on the inside shoulder (the shoulder closest to us), we can work the exercise from a distance by moving our horse around us in a circle. Trying this at the walk is necessary to learn to coordinate the flexing action of the line with maintaining the forward while moving our horse off the inside shoulder, all at the same time. It is then possible to do at trot and canter. It is not always easy to coordinate moving the horse forward with the end of our line, flexing and releasing the line attached to the halter and keeping the shoulder moving away from us, all at the same time. The same suppling exercises can be used while riding. The flexion and release is now transferred to the rein (or line). 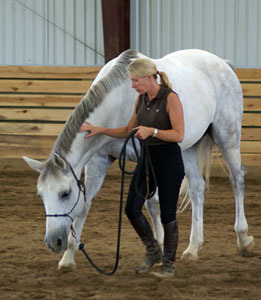 Allowing the nose to reach to the ground places the horse's weight primarily on the forehand, but before dressage riders gasp too loudly, this stretch through the back allows the hind legs to step farther underneath the horse's belly, simultaneously strenghthening muscles in the hind quarters and thereby preparing the horse for collected work later on. 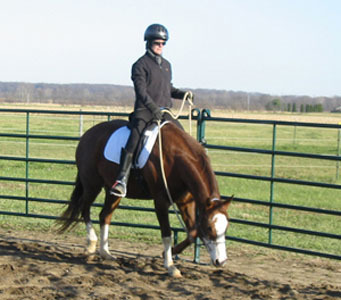 Yielding the hindquarters, or crossing the inside hind leg in front of the outside hind, is another commonly used suppling action for the hindquarters, both on the ground and in the saddle. Yielding the hindquarters in response to a flexion in the front end means that the softness is traveling through the full length of the horse's body, laterally. 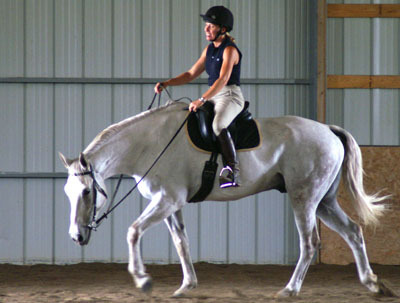 I see many handlers and riders hold the flexion for the duration of the time they wish the hind legs to cross. But a far greater degree of softness, suppleness and inner calm can be achieved if a release is given each time the horse crosses its hind legs. The flexion is applied as the inside hind leg is just about to step off the ground. The release is given on the line as the inside hind leg crosses in front of the outside hind. Note the reach with the inside hind leg, the lowering of this mare's head and neck, and her relaxed expression as she is allowed the room to "let down." These exercises represent a very limited sampling with minimal explanation. It is also true that "exercises" tend to be used as a formula for achieving outcomes, in which case they become mechanical and superficial and do not reflect the lightness and calm that enables the genuine, inner rapport we all seek with our partners. This gets back to the pyramid and how developing feel is a vital prerequisite to becoming a good horseman. I prefer to think of "exercises" as time spent with my horses, exploring and learning when they are softening physically, and then relaxing internally or emotionally. Through this exploratory process, I learn how vast the horse's body is and how many places can store tension, translating to a brace. While a brace indicates a place where the horse was not given ample time or space to learn to let go of that particular area and relax, it also indicates a muscle weakness. Only a muscle that is relaxed can be properly strengthened. Temporary irregularity in a walk, trot or canter (lameness) can be the result of a horse who holds tension and tightness on one side of its body, resulting in a shortness of stride. Lameness can also be the result of a horse (particularly an older horse) letting go of a brace for the first time, or the first time in a long while. As the taut brace is released into relaxation, the weakness in the muscle is exposed and appears to function inadequately until that muscle can be strengthened. For performance horses or horses who have demanding jobs, our ability to discern this dynamic can be of particular importance for their soundness and longevity. For any horse, it can add immeasurably to preserving their sense of ease, and so their spirit. For us dressage riders, being willing to take the time it takes to build a foundation based upon real understanding of the horse means we are not dependent upon using secondary equipment, such as side reins and draw reins, to compensate for our lack of feel. For example, allowing our horses to stretch where they need in order to release tension allows them to move to their fullest athletic capacity, as opposed to limiting them with lines that have been preset to a particular length in order to manufacture an image of "proper" head carriage. At this stage, the vast majority of horses have not learned to be at ease with the confinement that side reins and draw reins present to them, even when those reins are at their longest setting. Having horses that do not complain is not the same as providing them with a truly positive experience of what we're asking of them. So while we're "making our horses round" externally, inside they are suffering - some tolerantly, some in a more obvious way. I am not saying that these additional types of equipment are never useful, or that they don't benefit some horses and some people at certain stages of development in some cases. I am saying that I have spent an extensive amount of time doing it both ways, and have experienced the far greater benefits that result from taking the time it takes to develop skills that are motivated by a sincere desire to understand the horse, thereby putting the horse's internal (as well a external) sense of well-being above whatever ambitions I may have for him.